That video is highly flawed, and to underline my point, no evidence of planted explosives was ever found after more than 10 years. Here is another example that foreign terrorist, not the U.S. government, were responsible. I have said that many times that heat weakened the structural supports to the point of failure, so it was just a matter of time before the buildings would collapse. What explosives did the commission look for again? You don't find what you don't look for do you?! On the basis of....Al-Qaida saying....nothing, they are determined guilty!! The judge then TRIPLED the amount of damages, which causes more misinformation in your headline. Glad to see you're back to you're old tricks! Once again, there were no explosives planted nor used, and no evidence found to support planted explosives after more than 10 years. Well, the judge found no evidence of planted explosives either, but it seems there are those who tend to overlook the messages and hints presented to them. Perhaps I should add another. Insurance Company Sues Saudi Arabia For "Funding The 9/11 Attacks"
Lloyd's insurance syndicate has begun a landmark legal case against Saudi Arabia, accusing the kingdom of indirectly funding al-Qa'ida and demanding the repayment of £136m it paid out to victims of the 9/11 attacks.The Brighton-based Lloyd's 3500 syndicate, which paid $215m compensation to companies and individuals involved, alleges that the oil-rich Middle Eastern superpower bears primary responsibility for the atrocity because al-Qa'ida was supported by banks and charities acting as "agents and alter egos" for the Saudi state. Now, that is amusing considering that Bin Laden eventually admitted responsiblity for the 9/11 attacks, so what was Al Qaeda going to do had they responded? Apply for loans from American banks? Based on what investigation specifically looking for explosives? & the judge determined that how? Reading reports? or multiple tests for a variety of explosives? In your interpretation of a statement made by him, which not everyone agrees with. Show me the quote where Bin Laden says 'yes I masterminded 9/11 and ordered the hijackers to do what they did, it was all me' and I will admit I'm wrong. Wouldn’t they have remembered to include a confession if the videotape were fake? Wouldn't they have remembered to include a confession if the videotape were fake? While viewing the "American video", both historic and technical inconsistencies were found. Granted, the tape is the most analyzed tape in the world, still, most of the analysis was centered on the looks of Bin Laden, his voice quality, his words, and none reported an investigative analysis that considered post-taping edits. Furthermore, none of the analysis considered in depth the words of the visiting sheikh, and what he said was crucial to pinpointing the historic inconsistencies. Oh, “just how fake” are you suggesting it is? I thought you were suggesting the bin Laden in the 2001 videotape was an actor. I do like this line from the article, “Also, and most importantly, that certain camera angles and motions seemed too similar to a hat camera that football umpires wear”, as I have long thought this was a covert filming; bin Laden didn’t know he was on camera. But the discussion on so called historical inaccuracies in the link is easily discarded waffle. A tape aired by Al-Jazeera television Friday showed al-Qaida leader Osama bin Laden admitting for the first time that he orchestrated the Sept. 11, 2001 attacks and saying the United States could face more. I want to reveal a plot, which many people are still unaware of even though I have brought this up before, but there are those who have not heard ot the plot to bomb American airliners and fly aircraft into buildings within the United States. Plan to use suicide pilots against US targets was uncovered as early as six years ago during the investigation that led to the arrest of the alleged mastermind of the 1993 World Trade Center bombing, a Philippine police official said yesterday. Chief Superintendent Avelino Razon also said it was "too much coincidence" that Tuesday's attacks using commercial jets as flying bombs was close to the anniversary of the Sept. 5, 1996, conviction of Ramzi Yousef, Abdul Hakim Murad and Wali Khan Amin Shah for a plot to bomb US airliners in 1995. Murad was arrested in Manila in January 1995 after fire broke out in an apartment he shared with fellow Pakistani Yousef, the alleged mastermind of the 1993 bombing that killed six people and injured 1,000 others. Shah says he is Saudi Arabian with links to Afghanistan. Razon, then commander for special operations of the Presidential Security Group providing security for the visit of Pope John Paul II that began days after Murad's arrest, said he was captured after he returned to his apartment to dispose of bomb-making materials. Yousef was captured in Pakistan. "When we interrogated Murad, he mentioned that he was a skilled pilot, trained in the US, in Afghanistan and also here in the Philippines, who was recruited to undertake a suicide mission," Razon said. "He was committed to ... fly a plane and ram it into some targets," Razon said, adding that information from a laptop computer seized from Murad indicated one target was CIA headquarters. "There was mention of about a dozen" trained pilots to be recruited for such attacks. "I didn't imagine that they would ram a 757 aircraft into the World Trade Center. I thought the suicide mission [would involve] a Cessna light aircraft loaded with several kilos of explosives, like a Japanese Kamikaze World War II pilot diving into a target," he said. Yousef and his group allegedly planned to bomb 11 US commercial aircraft under "Project Bojinka." But Murad's arrest foiled the plan, Razon said. Prosecutors in the US trial of Yousef, Murad and Shah said the bombings would have killed 4,000 people in planes flying to Los Angeles, San Francisco, Honolulu and New York, and were aimed at forcing the US to pull out of the Middle East and stop supporting Israel. The three men were convicted of all charges. Yousef also was found guilty of killing a man with a bomb on a Philippines Airlines jet in 1994 that prosecutors said was a test run for the plot. We need to pin the blame on foreign terrorist who were responsible for the 9/11 attacks, not the U.S. government. Had "Project Bojinka" been carried out by foreign terrorist, there would be those claiming that the U.S. government was responsible for the bombings. I hardly ever understand what you are saying, skyeagle. Can you explain what use a confession would be if it were faked? That is what Scott has suggested and you are responding to. We need to pin the blame on foreign terrorist who were responsible for the 9/11 attacks, not the U.S. government. Do you understand there are foreign terrorists who report to U.S. government elements? Why would anyone be looking for explosives? There would not have been enough time to plant explosives on the upper floor levels after the impacts, but look at this photo where explosives were used in 1993. NIST found that the condition of the steel in the wreckage of the towers does not provide conclusive information on the condition of the building before the collapse and concluded that the material coming from the South Tower was molten aluminum from the plane, which would have melted at lower temperatures than steel. NIST also pointed out that cutting through the vertical columns would require planting an enormous amount of explosives inconspicuously in highly secured buildings, then igniting it remotely while keeping it in contact with the columns. Usama bin Laden (search ) made his first televised appearance in more than a year Friday in which he admitted for the first time ordering the Sept. 11 attacks and accused President Bush of "misleading" the American people. Injecting himself into the campaign four days ahead of the presidential election, bin Laden said the United States can avoid another Sept. 11-style attack if it stops threatening the security of Muslims. In the portion of the tape that was broadcast, the Al Qaeda leader refrained from directly warning of new attacks, although he said "there are still reasons to repeat what happened." "Your security is not in the hands of Kerry, Bush or Al Qaeda. Your security is in your own hands," bin Laden said, referring to the president and his Democratic opponent. "Any state that does not mess with our security, has naturally guaranteed its own security." Admitting for the first time that he ordered the Sept. 11 attacks, bin Laden said he did so because of injustices against the Lebanese and Palestinians by Israel and the United States. Bin Laden's confession wasn't a fake. There are those who've claimed his confession was a fake, but cannot provide evidence. They have claimed that Bin Laden was dead before we got our hands on him, but even Al Qaeda and the Taliban admitted that Bin Laden was killed by American commandos. In other words, there are those who are willing to pull things out of thin out with no backing evidence and do so in order to cloud events surrounding the 9/11 terrorist attacks. Bin Laden's confession wasn't a fake. How do you know the videotape was not a fake? but even Al Qaeda and the Taliban admitted that Bin Laden was killed by American commandos. What Al Qaeda and Taliban source admitted that? And how did that source know bin Laden was killed by American commandos? But, the terrorist who were responsible for the 9/11 attacks did not have the backing from the U.S. government. In other words, the U.S.government was not responsible for the 9/11 attacks and would not have supported such terrorist attacks on its own soil. In doing so, would have subject a large number of government employees and contractors to the death penalty and long prison sentences and in addition, would brought down the U.S. government. Can you imagine the reaction on the world stage if determined that the U.S. government orchestrated the 9/11 attacks upon its own citizens? Now, imagine the reaction from the American people and the dire implictions for government officials, not to mention the mistrust of the government by contractors, which would affect future contracts with the government. In other words, had our government been responsible for the 9/11 attacks upon its own citizens, it would not have taken very long to reveal the plot and the U.S. government as we know it today, would cease to exist. I agree the videotape was not a fake…How do you know the videotape was not a fake? For one, the United States tried to discourage Al-Jazeera from showing the tape. Another clue, did Al Qaeda deny the authenticity of the video? If not, then that is another hint the tape was not a fake. Al-Jazeera, which is based in Qatar, broadcast about seven minutes of the tape. The station's spokesman, Jihad Ali Ballout, said Al-Jazeera aired what was "newsworthy and relevant" and refused to describe the unaired portions, including whether they included any threats. Ballout said the station received the tape Friday but would not say how. Before the tape was aired, the State Department asked the government of Qatar to discourage Al-Jazeera from broadcasting it, a senior State Department official said. In other words, the U.S. government did not want the tape aired. That admission was made on militant websites by "the general leadership" of al Qaeda. IAnd how did that source know bin Laden was killed by American commandos? Yes! You only have to look, not only at the admissions from Al Qaeda and the Taliban on Bin Laden's death and their admissions that America was responsible for the death of Bin Laden, but look at the timing of Al Qaeda's reorganization right after the American raid on Bin Laden's compound. To sum it up, you just fit all of the pieces of the puzzle together to obtain a picture of what has been going on. But, the terrorist who were responsible for the 9/11 attacks did not have the backing from the U.S. government. The CIA had infiltrators in Al Qaeda. How do you know the hijackers were not agents of an element within the U.S. system? For one, the United States tried to discourage Al-Jazeera from showing the tape. The evidence to which Scott referred, and you responded, was the 2001 videotape. This tape was found and released by U.S. authorities. How do you know the 2001 bin Laden videotape is not fake? That doesn't mean we supported Al Qaeda's 9/11 attacks upon our country. You infiltrate organizations to gain infomation. Simple! It was known for years before the 9/11 atacks that the CIA was the focus of an Al Qaeda attack, and that an aircraft was to be flown into CIA headquarters. It would not have been prudent for the CIA to support a terrorist attack upon its own headquarters. The US government has been pulling this crap for years. Blowinwwg up the Battlesip Maine got us into the war with Spain. Pearl Harbor got us in into world war II. The only person not surprised was Roosevelt. And LBJ used the phony Gulf of Tonkin attacks to get us into the Vietnam War. So 911 was just more game concocted by the government and used to invade Iraq with its massive oil reserves. I didn’t ask about “we” or “the CIA”. I asked, how do you know the hijackers were not agents of an element within the U.S. system? But, we didn't conduct the 9/11 attacks. It was clear the attacks were conducted by foreign terrorist, and a plot was hatched years before 9/11. Here's one example. 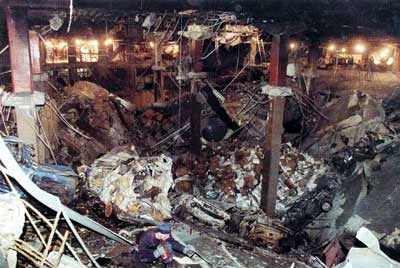 Ramzi Yousef (Arabic: رمزي يوسف‎, Ramzī Yūsuf; born May 20, 1967) was one of the main perpetrators of the 1993 World Trade Center bombing and a co-conspirator in the Bojinka plot. In 1995, he was arrested at a guest house in Islamabad, by the Pakistani Inter-Services Intelligence and United States Diplomatic Security Service, then extradited to the United States. He was tried in New York City in the U.S. District Court for the Southern District of New York and along with two co-conspirators was convicted of planning the Bojinka plot. Yousef stated: "Yes, I am a terrorist, and proud of it as long as it is against the U.S. government and against Israel, because you are more than terrorists; you are the one who invented terrorism and using it every day. You are butchers, liars and hypocrites." He was sentenced to two life sentences for his part in the World Trade Center bombing and Bojinka plot. Yousef's uncle is Khalid Sheikh Mohammed, a senior al-Qaeda member accused of being the principal architect of the September 11 attacks. He is also in United States custody. After the successful test run of his trial bomb, Yousef returned to Manila and began preparing at least a dozen bombs each with a larger weight of explosive materials. Just weeks before the Bojinka Plot was due to be launched, however, a fire started in Yousef's Manila flat, forcing Yousef to flee the room, leaving everything behind. The fire made the apartment staff suspicious, and soon police, led by Aida Fariscal, raided the flat and uncovered the plot. A Philippine National Police raid in another Manila apartment also revealed evidence that Abdul Murad, Khalid Sheikh Mohammed, and Yousef had drawn up plans for flying an airplane into the CIA headquarters. The information was passed on to the FAA, who warned individual airlines. I didn't ask about "we" or "the CIA".